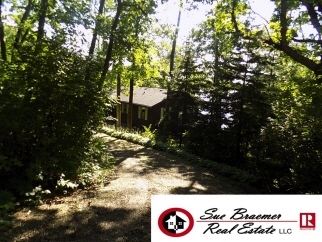 Price Reduced ***Charming Lake Hide-a-way completely surrounded by woods! Great westerly views of the sun and all wildlife. Open concept living/kitchen areas facing Lake Sinissippi giving you a view of all the boats and people enjoying the lake. Three bedroom, 2 full bath home has a lower level walk out from the family room to lakefront with pier and storage building for paddle boat and lawn tools. A very well kept lake home in a private setting. Must see!